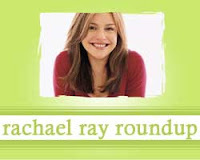 There were lots of folks cooking lots of Rachael Ray recipes out in the blogosphere this week! Everyone must be all jazzed up about the amazing summer produce that's out there this week. Speaking of which, on my To Do list this weekend is to try some grilled peaches with ice cream from the August issue of Every Day with Rachael Ray (sorry, they don't have the recipe up yet!). I mean, really. How good does that sound? Andie at Sweet. Southern. Spirited. made recipe that I definitely have to try - Falafel Burgers. How good does that sound? They don't seem to sell tahini in the tri-county area, so I'll have to special order it first. Andrea at Nummy Kitchen tried Rachael's Cheesy Orzo recipe. Teresa at I'm Running to Eat made a great recipe for Summer - Spanish Shrimp and Chorizo Skewers. While making Rachael's recipe for Gnocchi with Sausage and Swiss Chard, Alexis of Alexis a la Carte realized she doesn't like Swiss Chard. Kirstikimberly at Peyton in the Pantry tried a Tuna Melt recipe from 2, 4, 6, 8. You can check out a review of another melty recipe at Dinner is Served, where K tried Rachael's Cassoulet Stuffed Bread Melts. You know, I don't think I checked there. I'll make sure to check that next time! If you have any local lebanese or middle-eastern restaurants, they may sell cans of tahini, too. That's where I get mine - at a local lebanese restaurant. awesome! Thanks for stopping by and linking over to me! and tahini- do you have a whole foods near you? they always have tahini. I skipped on the tahini, though, and just did some plain yogurt flavored with seasonings instead. Tasted great!